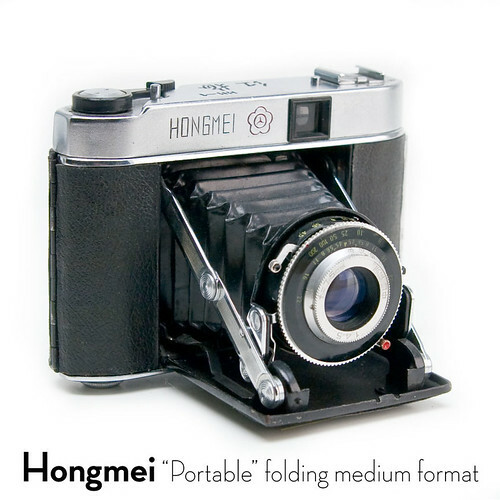 The Hongmei HM-1 self-erecting folding camera for type No. 120 film rolls was made by the Changzhou Camera Factory in Changzhou, China. On top it had a film advance lever for fast film advance and a shutter release button. The optical viewfinder was integrated into the top, below the accessory shoe. The PC flash synchronized leaf shutter offered speeds 1/10 to 1/200 sec plus B mode. The lens was a coated 5cm 1:4.5 three-element type, focusable from 1.5 metres to infinity. It could take 6x6cm or, by means of hinged masks, 4.5x6cm images.